Jeez, think they have a long enough name? I stopped back in the equipment room I entered earlier in an attempt to re-energize the elevator and take it for a ride. I noticed that, indeed, there was some unique telecom equipment in this closet. 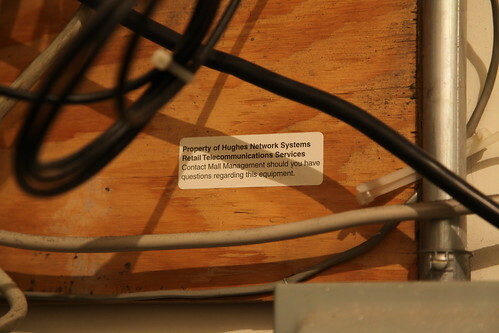 Besides just 1990s fiber optic technology, there was also this tag, which reads, "Property of Hughes Network Systems Retail Telecommunications Services, Contact Mall Management should you have any questions regarding this equipment." Hughes Communications is a provider of satellite-based communications services. The company operates its satellite business through its wholly owned subsidiary, HughesNet. In 2011, Hughes was acquired by EchoStar in a deal valued at US$1.3 billion. Hughes provides one-way and two-way satellite Internet access technology and service in United States and Europe, in areas with a clear view of the southern sky. Originally branded as DirecPC and later DirecWay, it was originally marketed to business customers as a side venture to the consumer product DirecTV.